Health and our safety are primary needs in everything we do whether in our workplace, at home or when visiting some other location. The importance of health and safety awareness and training is understood by most organisations and there is legislation in place in Ireland that states that employers are required to ensure their employees safety health and welfare in the workplace as far as is reasonably practicable (see Citizens Information for the legislation on health and safety at work). Clive Kelly Safety operates in County Clare and has provided Safety training courses and other safety services to employers and employees throughout Clare for the past decade and more. Clive Kelly has a wealth of knowledge in the field of Health and Safety and is well qualified to provide training at the highest level. All of the safety training courses listed are offered at the clients’ premises using the clients equipment. This ensures that employees are trained ‘on the job’ and at the location where the safety training applies. 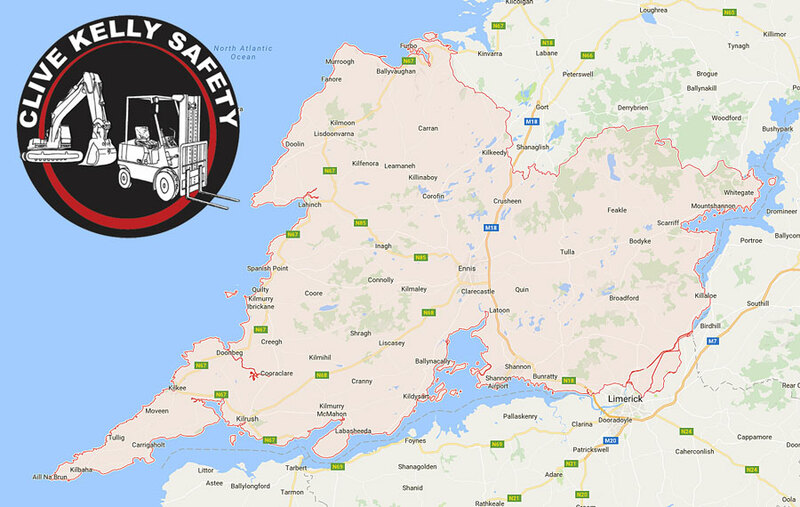 While the safety courses and safety services offered by Clive Kelly Safety are likely to be of most benefit companies and employees located Ennis, Shannon Kilrush, Ennistimon, Gort and Kilkee, these services also are offered throughout Clare and the surrounding regions. Please contact Clive Kelly for more information on any of these services.